Peter Duffy, 88, of Clearfield, SD passed away on Monday, Jan. 15, 2018 at the Avera McKennan Hospital in Sioux Falls, SD. Funeral service were held on Saturday, Jan. 20, 2018 at 11 a.m. at the Christ Lutheran Church in Winner. Burial followed in the Winner City Cemetery. 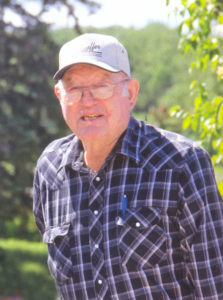 Peter was born on June 13, 1929 in Long Pine, NE and was the son of Gilbert (Gid) and Florence Mildred (Cleal) Duffy. He lived at Duff, NE until the age of 10. Pete, his brother Gilbert, Jr. and a family friend moved the family’s cattle herd to their new home in Clearfield, SD. He graduated from Winner High School in 1948. In high school, he enjoyed playing football and Legion baseball. Pete was an avid pool player at the Peacock Café where he shared his pool earnings with his younger siblings. He joined the Air Force in 1949 and was stationed in Wichita Falls, TX, Rantoul, IL and Japan during the Korean War as a sheet metal man repairing planes until 1953. He was awarded the Korean Service Metal, United Nations Service Medal, National Defense Service Medal and the Good Conduct Medal. After his discharge, he returned to the family farm in South Dakota. Pete met the love of his life Delores Marie Miller at the Colome Legion Hall. They were united in marriage on Aug. 25, 1957 and shared 60 years together. They resided southwest of Keya Paha until the spring of 1962 then moved to their current residence. To this union were born six children: two sons and four daughters. Pete was an Elder at Redeemer Lutheran Church and a delegate to the Clearfield/Winner/Hamill Tri Point Parish; he was a member of the VFW, National Farmers Organization, Farmers Union, Star Prairie School Board and Star Prairie Township Supervisor. He enjoyed dancing with the Boots and Calico Square Dance Club and also at the Carlock Dance Hall. Pete was passionate about family, baseball, the democratic process and his herd of cattle. He would like to consider himself an expert pitch player, square dancer and all around funny guy. He loved celebrating numerous birthday parties with his family along with the many milestones of anniversaries, births, graduations and weddings. He was preceded in death by his parents; sister Bernadine; brothers Bill and Jr.; brothers-in-law; Dale Short and Kenneth White; nephews Rollie Duffy and Darwin Eihusen and niece Deanna Kent. Peter is survived by his wife Delores Marie (Miller) of 60 years. Six children: Bradley (Judy) Duffy, Winner, SD; Deborah (David) Pazour, Kimball, SD; Daniel (Patricia) Duffy, Winner, SD; Deanna (Tom) Calligaro, Fairfax, VA; Barbara (Mike) Jonkers , Avon, SD; Brenda DeGraw, Sioux Falls, SD. 13 Grandchildren: Katlin Duffy (Josh), Sioux Falls, SD; Allison Duffy, Chamberlain, SD; Shannon Duffy, Vermillion, SD; Lindsey (Mike) Cottrell, Sioux Falls, SD; Haley Pazour, Brookings, SD; Samantha (Aaron) Cable, Rapid City, SD; Danee (Ryan) Bricker, Evergreen, CO; Larissa (Brady) Bertram, Watford City, ND; Skyler (Tanner) Best, Winner, SD; Pierce Jonkers, Avon, SD; Dacotah DeGraw, Watertown, SD; Wyatt DeGraw, Sioux Falls, SD; Preston DeGraw, Sioux Falls, SD. Six great-grandchildren: Aiden, Stiles, Dieter, Slade, Franki Grace and Porter. A brother Jack Duffy, Louisville, CO and a sister Mary Alice Short, Doniphan, NE and numerous nieces, nephews and in-laws.